MacKenzie Commercial Real Estate Services, LLC is pleased to announce that Mouth Party, LLC, Baltimore-based maker, retailer, and wholesaler of caramels, has signed a lease for approximately 8,000 square feet in Baltimore County, Maryland. The new space, located at 1946 Greenspring Drive, Timonium, Maryland, will act as the local firm’s head quarter and manufacturing location, and also provide a small retail outlet component. MacKenzie Executive Vice President Chris Bennett and Real Estate Advisor Allison Perry represented Mouth Party in the transaction. Lauren Lindsay and Vince Bagli of Merritt Properties represented the landlord. Derived from a four generation family recipe, Mouth Party, LLC started in 2007. The first batches of caramels were made in the home of owner B.G. Purcell. Consistent growth in demand and popularity has had the company outgrowing their locations since; the group was once housed in the kitchen of a school, then a commercial kitchen space that also had a small retail component, to a production facility in Meadow Mill, a Hampden neighborhood just north of downtown Baltimore. Area floods in 2016 caused the company to move to a temporary location off Cold Spring Lane. Evaluating their business and growth plans, the company was again in need of a new, larger space. The group will take occupancy this August. Mouth Party Caramels can be found online and in more than 120 local and national retail locations that include gourmet and specialty food stores, retail boutiques, cafes and coffee shops, hotels, wine shops, and more. Their product is made fresh to order, cooked in small batches, and packaged by hand. Also, with a strong, personal connection to cancer research and support services, the company donates a percentage of their net profits to help fuel research and efforts that heighten public awareness of cancer associated problems. 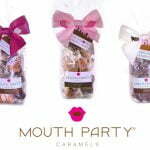 For more information on Mouth Party, LLC, please www.mouthpartycaramel.com. For tenant representation or full service commercial real estate needs, please contact Chris Bennett at cbennett@mackenziecommercial.com or 410.953.0352, or Allison Perry at aperry@mackenziecommercial.com or 443.573.3208.